Now I’d like to ask about something entirely different. Masuda-san said he wanted to make big changes because you were making a completely new sequel for the same hardware, but Pokémon is Pokémon, so there are some things you just can’t change. Sugimori-san and Masuda-san, I’d like to ask you if there are any parts when you’re working on a Pokémon game that you hold sacred and don’t want to change. Sugimori-san, would you go first? These games come after those two and the hardware is the same, so I knew people would not be tempted to play them unless we really surprised the players. 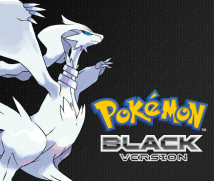 And Pokémon "Diamond" Version is a rather grand name to follow. So everyone on the team was working under that pressure. But whenever we asked ourselves “What is Pokémon?” there were always some things that we couldn’t change. You can tell what we considered inviolable by looking at what didn’t change this time. Oh, I see. 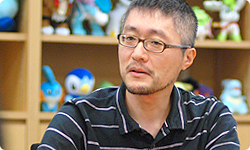 You changed a lot, so what you didn’t change must be what’s important for making the Pokémon games be Pokémon games. That’s right. After all, beginning with a professor speaking is surprisingly important. That alone makes a game feel like a Pokémon game. Part of Pokémon-ness is beginning with a professor asking you to choose a Pokémon. Yes. Another thing is a certain down-to-earth characteristic. Until now, the stories have been small in scale — set in Japan, telling the tale of one young boy’s summer. That’s the basis for the Pokémon games. The story of a young boy catching bugs in the summer. Yes, it’s like an extension of that. The basis for the Pokémon games is the development of a story in a land the size of part of Japan, which is about a regular boy without any special powers, but who sort of goes out and catches bugs and grows up a little in the process. This time, the setting is a place like New York, so the scale is big, but we kept that basis in mind when designing all the characters, and, well, how should I put it? We tried not to create anything that was too out of place or to veer too much into fantasy. I think a sense of being grounded and of being an extension of the real world is important. I see. 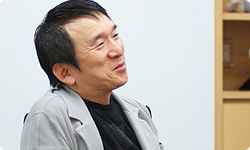 Masuda-san, what do you think is important to preserve in the Pokémon games? Now I’d like to ask about something entirely different. Masuda-san said he wanted to make big changes because you were making a completely new sequel for the same hardware, but Pokémon is Pokémon, so there are some things you just can’t change. you cross a big bridge part of the way through the story . Up until then, the world hasn’t changed that much. Yes. We purposely refrained from changing it. You changed so much but didn’t change that. I understand that’s because you were certain that changing it would stop it from feeling like a Pokémon game. Yes. The reason we explain in an orderly fashion what the Pokédex is, that there are gyms, or that there are Pokémon Centers, and so on, is that we consciously wanted players to fit right into the world as soon as possible. You kept the same structure as previous Pokémon games up until crossing the big bridge because you didn’t want players to be confused about how to play the game. Right. But after you cross the bridge, it’s more open and we say, “Now go and play however you’d like to.” Another important aspect in terms of the worldview is how we always try to achieve a sense of love and peace. I don’t want to create a world where people won’t give their seat to an elderly person on the train if there aren’t any priority seats set aside for the elderly. The Pokémon world has been like that from the start. Ishihara-san, what do you think is important for keeping Pokémon like Pokémon? I think one important aspect of the games that has kept people playing them for so long is that, whether it’s your first time, second time or tenth time, everyone starts the same way and, without any confusion, enters into the world of Pokémon and experiences fresh wonders. And even if generations change, the Pokémon games are a kind of tool that you keep on playing with. But simply preserving something that was successful in the past won’t make it last. Making changes is very important, but the only ones who can do that are the developers, like Masuda-san and Sugimori-san. This time, they really went all out and changed a lot I think. When I got a look at the games, I was like, “Wasn’t that something we needed to keep? !” That’s how much they had broken it down. For example, they told me the Technical Machines15 wouldn’t disappear after one use. 15Technical Machine: An item for helping Pokémon learn new moves. Until now, they disappeared after one use. For that reason, they were an item that some players would collect all 50 of but never use. The purpose for some was just collecting them. But if someone were to ask, “Don’t you want the players to try out a load of different moves?” I’d have to say, “Yes, I suppose so...” But, like Masuda-san mentioned earlier, I’d been involved with the series for a long time and the way I thought about it had become ossified. It was quite refreshing for that to be broken down. There was a lot of that this time. The makers are the ones who have the most strength for breaking down their own game. So that’s how the changes came about. You must really hope that people who want to see how the games have changed will play them. Yes. I want them to see what has and hasn’t changed.